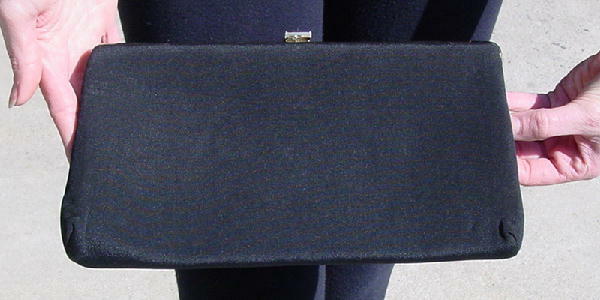 This vintage black clutch has a very nice thick peau de soie covering. It has a gold-tone rim and sides, and the top gold-tone metal bar is covered in fabric, so that only the 2 end balls are visible. It has a nice gold-tone center closure. The interior has a black fabric lining. 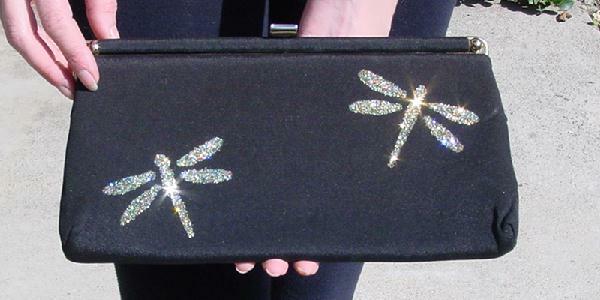 Eden added a 3" wide by 2" high dragonfly done in multicolored gold-based glitter on the upper right hand corner facing the outer right corner of the purse and one on the lower left hand corner facing the upper left hand corner of the purse. 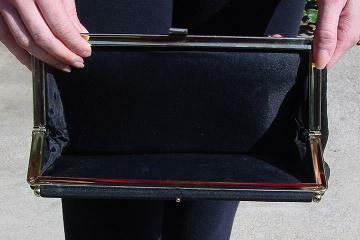 The purse can be carried in the middle, by the bottom, or from the top as a clutch. The dragonflies add life to this sophisticated yet otherwise demure evening bag.